Now you can become a National Guild of Hypnotist, Certified Hypnotist by graduating from either of our professional hypnosis programs. NGH requires 15 hours of continuing education credits to maintain active certification. Hypnotists from around the world will tell you that if they could only belong to one professional organization, it would be the National Guild of Hypnotists. If you are eager to see hypnosis become a separate and distinct profession and want to be a part of the one organization which is working to achieve this goal, you belong in the Guild. Our standards are high, but we are not an elitist group. Our mission is well defined, but we are open to new ideas. Our goal is specific and it includes all hypnotists. Please take this opportunity to learn more about the benefits of belonging to our organization and accept this as my personal invitation to apply for membership. First Time Applicant $75. Annual Renewal $75. A membership for professional hypnotists. Receive an 11" X 14" certified hypnotist certificate, annual renewal 5"X7" certificates and embossed membership card. Journal of Hypnotism, Hypno-Gram subscriptions, discounts, member-rate at conferences and seminars, client referrals, eligibility for professional liability insurance, access to our video rental library, plus all other membership benefits. A non-professional membership for those with a general interest in hypnosis. Receive an 8"x10" member certificate, embossed membership card, Journal of Hypnotism and Hypno-Gram subscriptions, discounts and member-rates at special events. Write, call, fax, or e-mail the Guild for a membership application. Members of other organizations are welcomed. Members of other organizations are welcomed. National Guild of Hypnotists, Inc .
Once a year, we convene at the large friendliest annual hypnosis convention in the world -- an enormously successful event, packed with information, inspiration & fun. This is the largest event of its kind in the world, attracting members from around the globe to share ideas, philosophies, and experiences. Established in 1951, the Guild has grown to over 6000 members, with over 63 local chapters world wide. A growing percentage of our members have academic credentials in other fields, including medicine, psychology, counseling and nursing. 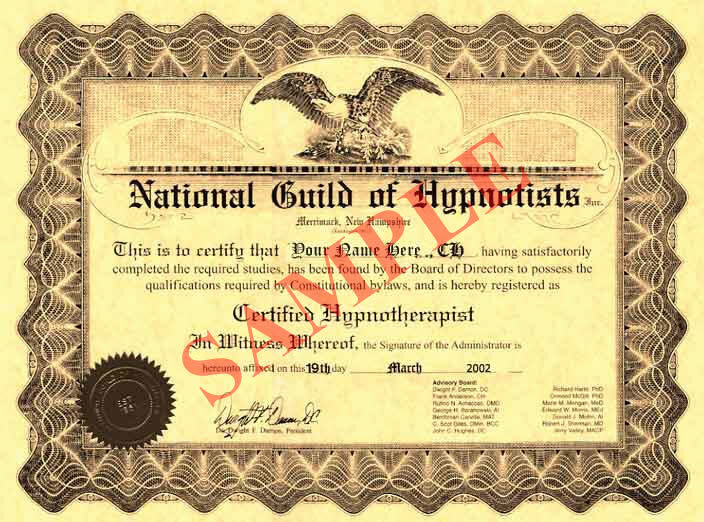 The National Guild of Hypnotists has been acknowledged, even by other professional hypnotism groups, as the number one association in the field. We invite you to share in the prestige and recognition membership brings, by joining the nation's premier hypnosis organization. As a member, you'll have access to the largest library of hypnosis related videos. You'll be entitled to substantial discounts on books, video, and audio tapes, equipment and seminars. To help educate your clients, we've prepared a series of pre-printed informational brochures on a number of relative topics. We also offer a number of professionally written hypnosis articles, ready for publication in local newspapers and magazines. Educating a providing information to our membership is our most important service. To insure members stay informed of all issues affecting their profession, all receive the Hypno-Gram newsletter and the acclaimed Journal of Hypnotism, quarterly. Year Round continuing education seminars and workshops on a wide spectrum of subjects are scheduled for our members at locations around the country. Opportunities are presented to sharpen skills, not only in the art and science of hypnosis, but also in the areas of marketing and managing successful practices. Our staff handles a multitude of calls from prospective clients and media professionals from around the world, seeking referrals to local Guild-certified hypnotists. We have referred many clients for hypnosis session, and many writers and TV and radio producers directly to appropriate Guild members. The Guild maintains standard codes of conduct and a strict code of ethics for all individuals and organizations in the field of hypnotism. A peer ethics committee exists to investigate any complaints. We strive to achieve harmony, mutual trust and cooperation among practitioners, and respect within the community. As a professional, certified member of the Guild, you will receive an impressive 11' X 14' certificate and an embossed wallet ID card, indicating your credentials and membership in the prestigious NGH. Certified members of NGH are eligible to apply for professional liability insurance for their practice as hypnotists -- Malpractice protection at reasonable rates!. Our staff works on your behalf 7 days a week, protecting, promoting and advancing the art, science, and philosophy of hypnotism. The Guild continues to make progress in establishing the profession of hypnosis and receives highest accolades and commendations from various state and national government offices. NGH offers a hypnosis certification core-curriculum which is taught by certified instructors throughout the world. Minimum requirement for certification is two semesters of hypnosis training. 15 hours of continuing education credits are required annually to maintain active certification separate board has been created to administer exams for Board Certification at three higher levels of academic and practical experience. * Guarantee: if you are not satisfied for any reason, by lunch break of the first day, turn in your materials and you will receive a complete refund. No questions asked.